Earlier this year, Dutch designer / furniture maker Marijn Dijker's BasaLED pendant lamps were featured on Dikore. Today, he returns with his all new BasaTABLE. BasaTABLE is sharp, stout, and strong with its solid wood top and steel legs. While it resembles Dijker's BasaLED, it didn't begin that way. 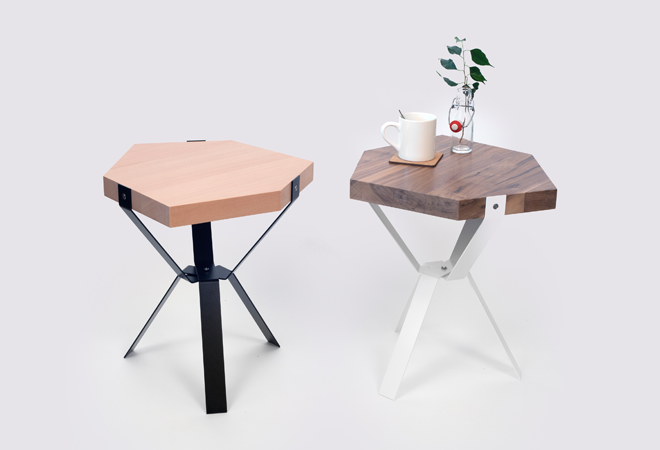 Dijker developed the tabletop into a hexagonal to reduce the amount of legs to 3. BasaTABLE is available in two styles: Beech/Black and Walnut/White. It is now available for purchase here.